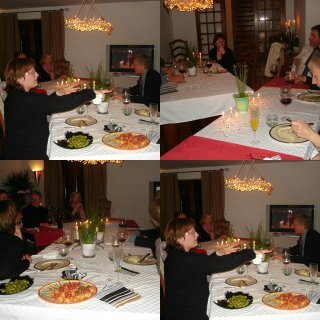 Last week we attended an Academy Awards dinner party in Montpellier, hosted by our friends Mary and Mike Faigle originally from Salinas. The dining room table was elegantly set with beautiful china and a 5 course meal was served as we watched the big screen TV of the replay of the Academy Awards.- homemade quesadillas and fresh guacamole for hors d''ouvres- champagne cocktails- salad with haricot vert- filet mignon and potatoes with celery root- a platter of cheese- assorte patisserieseach course was also served with a different declicious wineMary, the consummate host and expert on Films was the commentator and discussion leader of each film and more importantly of the dresses that the woman were wearing. Guests included an English couple and a Dutch couple as well as 6 kids who ate pizza and played in the family room while we ate dinner.It was a fabulous evening and now we have to go see all the movies we haven't seen that won awards.